Located mid-way between New York City and Boston, getting to Hartford couldn’t be easier. Plus, with an exceptionally well-connected downtown, getting around in the city is a breeze. Driving in? Hartford is within a two-and-a-half hour drive of more than 23 million people and is ideally located at the gateway to New England, where Interstates 84 and 91 intersect. Just 30 minutes north and south of Hartford, the Interstate system connects you to the Massachusetts Turnpike (Interstate 90) and the New York Thruway (Interstate 95). Taking to the skies? Bradley International Airport, which was recently named the nation’s third best airfield by Condé Nast Traveler Magazine, is only 15 miles from Hartford. Bradley serves the top airline carriers in the U.S. with 200 daily flights—34 are nonstop routes. Plus, the Bradley Flyer provides quick and easy travel between the airport and downtown Hartford. The trips only take about 30 minutes and operates approximately hourly between downtown Hartford and all the terminals at the airport, seven days a week for a one-way fare of $1.75. There’s even a designated stop at the Connecticut Convention Center to help get you to your meeting quickly. CTfastrak and CTtransit are great options for getting to and from downtown Hartford, including the Connecticut Convention Center. CTfastrak is Connecticut’s new bus rapid transit system with reliable and frequent service. CTtransit has convenient routes throughout the greater Hartford region. All routes plus real time bus information in the Hartford region are available in Google Maps and TransitApp, so you’ll know just when your bus is going to arrive. 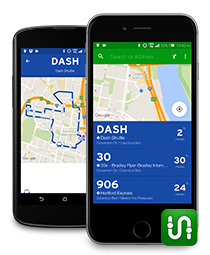 The dash is the most convenient way to experience downtown Hartford, connecting you from the Connecticut Convention Center to hotels, attractions, restaurants and entertainment throughout the city. The dash is a free, downtown circulator bus that departs from the Connecticut Convention Center every 15 minutes on weekdays from 7:00 AM to 7:00 PM. During major downtown events, the schedule may be extended to include evening and weekend service. For extended hours visit CTTransit.com. Getting around downtown on the dash just got easier! Download Transit App and get real-time updates on when the next bus will arrive.